Sixteen-year-old Lola is a daredevil. She likes playing hooky, making out with bad boy Everett James, and stealing cars. The reason behind all of her rebellious antics? Because she can. But what can one girl do against a horde of murderous vampires? Aided by her sometimes sober father, her best friend Travis, and Maximus, the mysterious stranger who appeared out of no where to save her life, Lola must accomplish what the rest of the human race has failed to do in the aftermath of the world wide massacre: survive. But how do you survive when everything you know has been destroyed... and the one person you thought you could trust ends up being the most dangerous person of all? Pitch is a very short read, only about 110 pages, but in that short amount of time a lot happens. I think the pace was excellent, it wasn't too fast or too slow. That was the main reason I really enjoyed this novella, the pace. I just felt like everything was done with good timing, which I think is something hard to do in such a short amount of time. I know I had trouble in my creative writing class with making the timing just right, and Jillian did it flawlessly. The story line was very interesting. 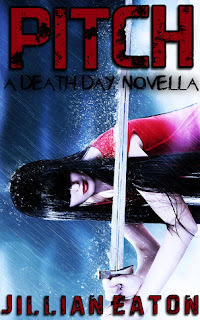 I am not a big fan on paranormal apocalypses, I am more of a fan of kissing vampires rather than killing them, but I found Pitch to be a very interesting read and a topic I enjoyed. I also really enjoyed the tension between our two main characters, Lola and Maximus. From the second they met I knew they were going to be a very interesting pair. The ending was awesome and definitely left me wanting more! I couldn't believe what happened and really hope there is more to it in book two. I really must know what is going to happen next and will definitely be continuing on with this series. Very, very good book. It is short so I read it all in one day, but even if it was longer I think I would have read it quickly just because of how interesting the story line and it's characters were. The pace was excellent and I never felt like the story was rushed or slowed down. The ending was fantastic and I cannot wait to get my hands on book two! I will definitely be continuing on with this series. I recommend this series to those who are into the paranormal and more specifically vampire take overs.